Last night it dropped down to 53 degrees. While I don’t like winter all that much, I do like hot chocolate, slippers and hoodies. Saturday I started working on a new painting. Sunday I took the day off and had some tea. Today I worked on the same piece for about an hour and a half. I finally got the laundry done. Fresh sheets. Is there really anything better? I remember a friend once saying that if she was rich that’s all she’d want. Fresh sheets every day. Well, today I got the laundry hung. Elizabeth, this is for you. 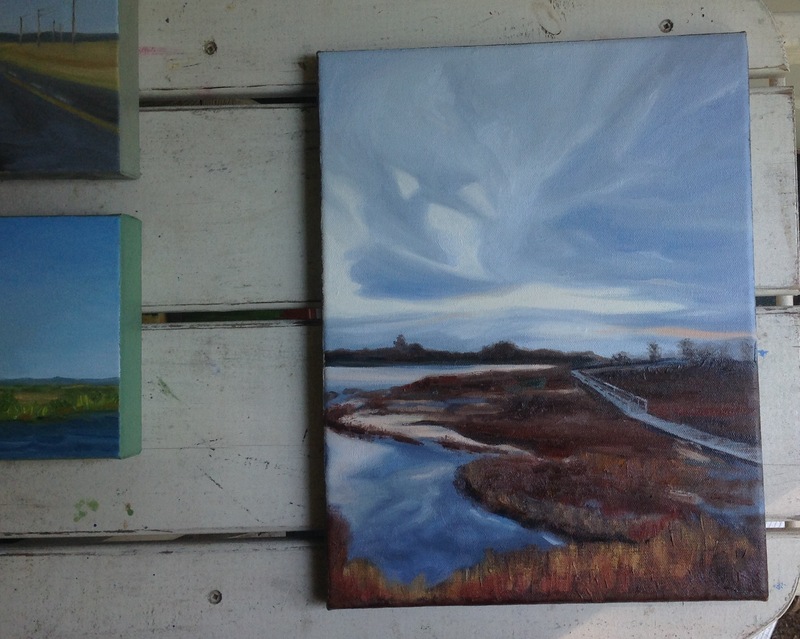 I also started the first layer on another study of an eastern shore landscape (bottom right). That means that I had better light for longer. Sweet! 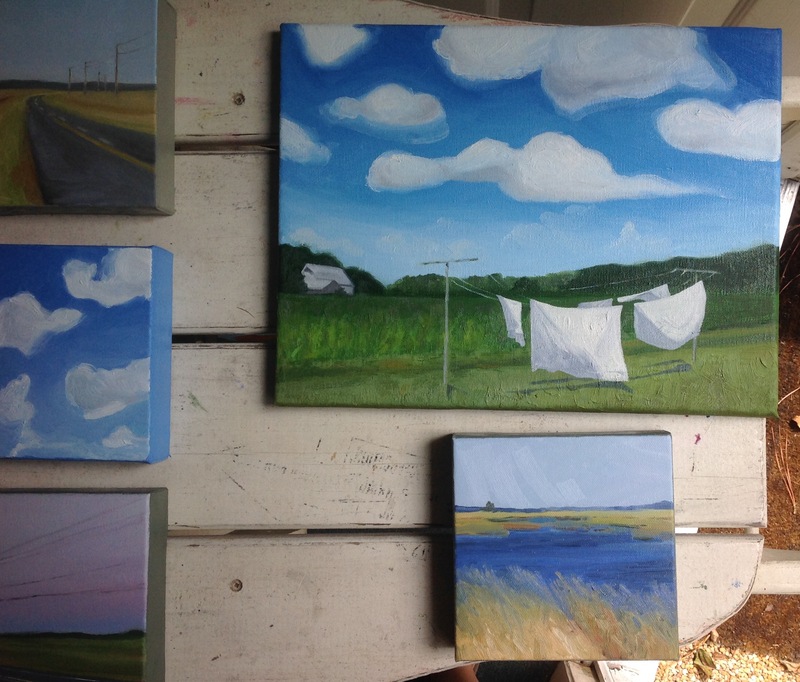 Today I started a new road-trip painting (top right) and started to add the clothes line into the bottom painting. When the paint dries a bit there will be some nice clean white sheets hanging there. (Thanks Mom)-this is a painting of my parent’s backyard. 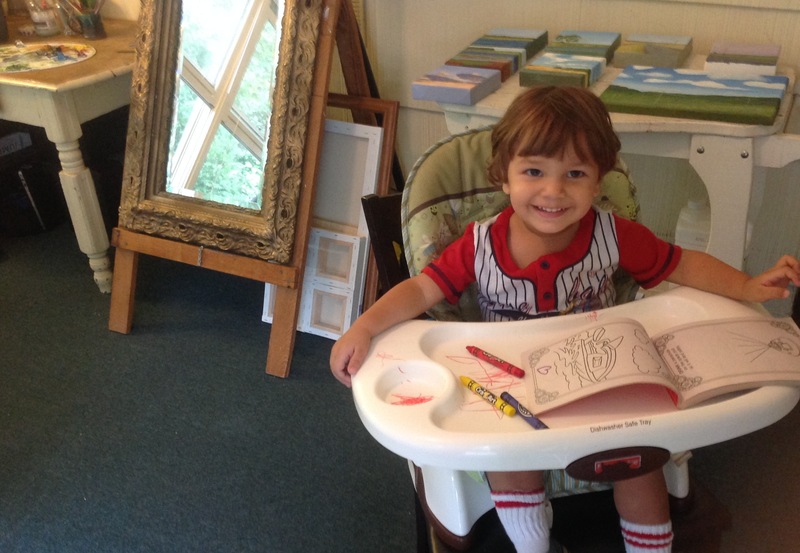 Christian is still sleeping, but I am taking a break because my studio is losing its natural light. boo. 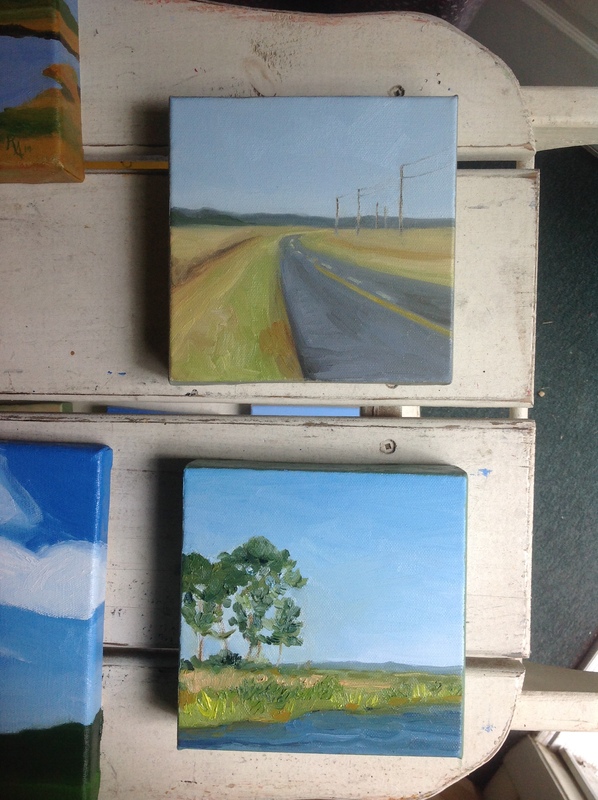 Over the last two days I was able to put the 1st layer down of two new 6×6 paintings. 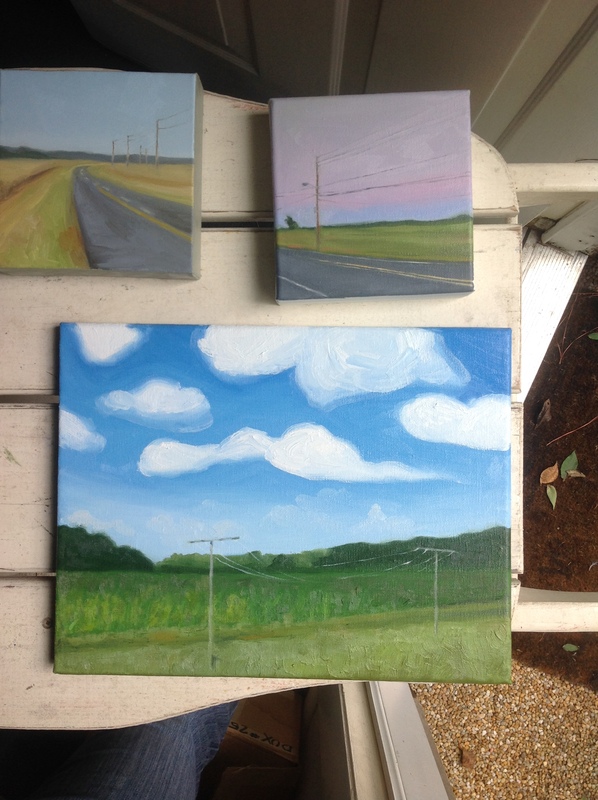 Both are inspired by Elliot Island, MD. 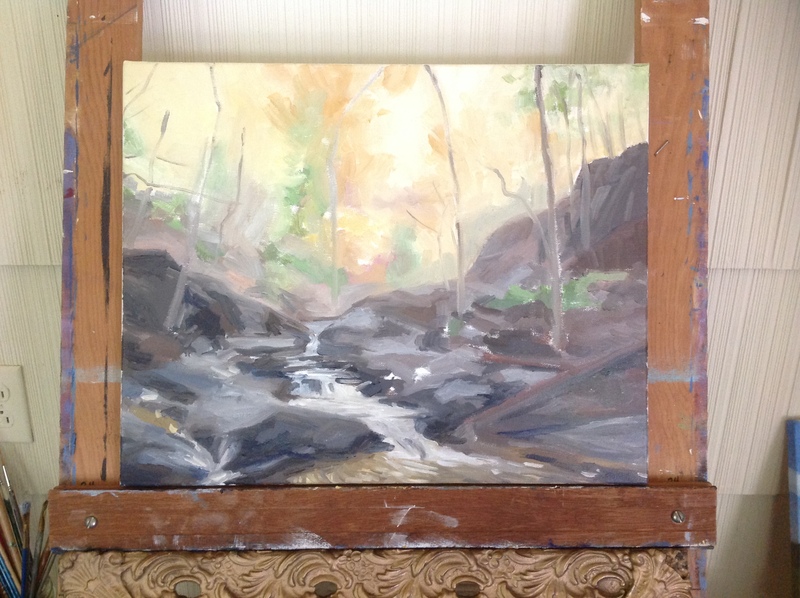 Yesterday I started the waterways image and today the country road. I am learning to be more bold in my paint thickness. This will help my efficiency in this series, I think. I can still remember my painting teacher telling me that I should lay it on. I guess back then I was more cautious about mistakes. I am really trying my best to get the values correct from the beginning- this allows me the confidence to paint thicker strokes.